Here's one of far more recent vintage. 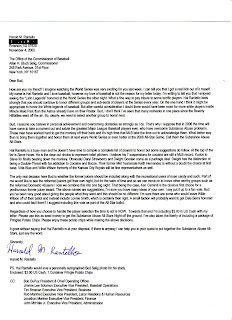 Harold M. Rantello, or Hal, is by far the alias I have used the most for these letters. Originally his letters focused on chickens and chicken related themes. It's fair to say Hal was obsessed with poultry. Eventually he branched out and started concerning himself with other topics. At this point almost every one of these letters I write comes from Hal. He's a fascinating guy so I like to let him have his say. This is also a good example of my penchant for mailing people random items to gauge their reaction. 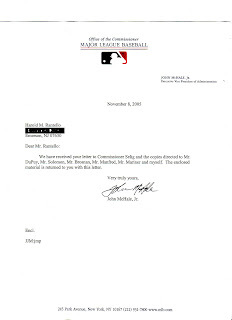 Doesn't sound to me like MLB has much of a sense of humor. 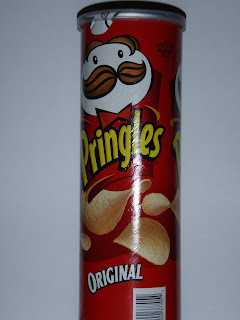 They mailed the Pringles back! I guess they weren't hungry.